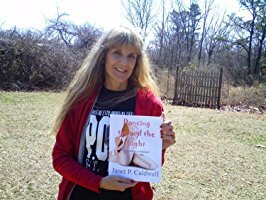 We may rightly feel Janet Perkins Caldwell’s passing from this world was way, way to soon. That she had so, so much more love and peace to shine on us all through her words and deeds. However, whether we personally knew her well or not, if we chose to read her poetic words, we would have learned she lived a very rich and full life. Under the tutor of her perceptive sensitivity, Janet deeply sensed and felt the full breadth of existence. Through the imagery of her words we experience the lowliness of her sadness, emotional pain, abuse, rejection, addiction, and then like a phoenix rising from the ashes, how she could resiliently fly with hope to the height of love, joy and fulfillment. The very essence of Janet’s words when exposed to the reader reveals she was at heart a spiritual being of the highest order. Her innate understanding for the oneness and interdependence of all things gave her the wisdom to create words of imagery that were real and original, at times very raw and yet so pure. Her words always flowed with the spirit of love and peace. Janet’s intent behind this was solely for the purpose of touching the very fabric of the human soul. She metaphorically showed us her humanness in such a way where we would say, “she gets it, gets us and we get her.” The reader will come to realize through the creative experience of her poetic words that Janet’s destiny is to remember her, truly as an artist who was spiritually, a Pro-Human, Social Activist in life. On a personal note, I am fully confident Janet’s creativity through words and deeds, her humanitarian contributions to the world will be remembered by all those she touched with the spirit of her gentle love and peace. Her spirit and friendship has enriched my life forevermore and I am a better human being for knowing her. Why? ‘Cause she was able to touch through poetry and deed the very fabric of my soul. and dear, dear friend to Janet Perkins Caldwell.